Whether it's for entertaining, spending time with the fam, enjoying your favorite pastime, or you just need a space to unwind after a long day at work, every home should have a dedicated fun zone. Perfect for embracing a little jovial distraction, the design really comes down to your game-playing faves. Are you a shuffleboard champion, a savvy pool shark, or maybe a ping pong master? Whatever your game of choice, you'll want plenty of space and comfy seating to accommodate friends and family without compromising on style. Ahead, 12 modern and playful game rooms that are guaranteed to keep the good times rolling for years to come. So, let the games begin. 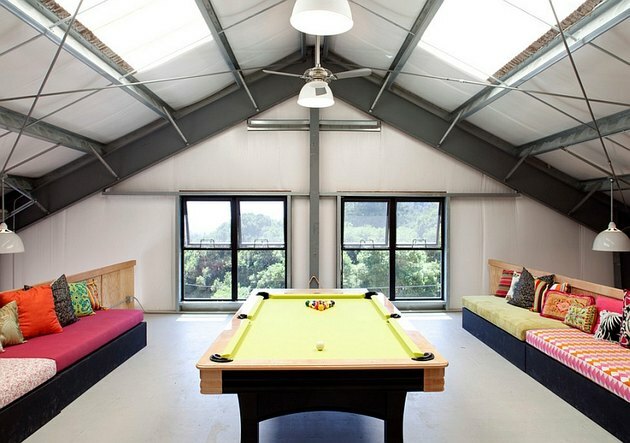 When you walk into this attic turned grown-up pool hall, your eyes are immediately drawn to the lime-green billiard table. Sleek sofas with vibrant cushions and throw pillows punch up the color without compromising the clean, contemporary aesthetic. This den of merriment designed by Kristin Peak Interiors has it all. From the Giant Wall Scrabble, to the ping pong table, to the pool table, to the bar, this game room provides endless opportunities for fun. Hats off to Denise Kuriger Design for this dreamy oceanside retreat located in Malibu. 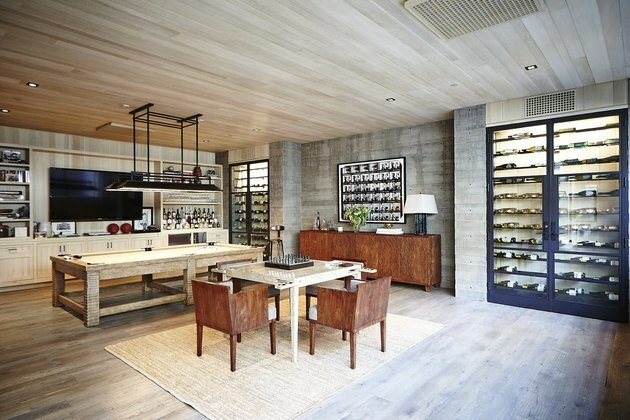 Concrete clad walls lend a cool industrial sensibility that's warmed by a gorgeous wood plank ceiling. Soiree-ready, this modern coastal playground boasts a pool table, game table, large flat screen TV, fully stocked bar, and wine cellars with floor-to-ceiling glass doors. Right off the bat, we're struck by the bold and edgy color palette of this eclectic and sophisticated game room. Designer Sofia Aspe had a very distinct vision, and accomplish that she did. The neon pink pool table and bright purple chairs really pop against the dramatic fireplace wall. A fun and functional game room that marries modern style and character-rich accents. 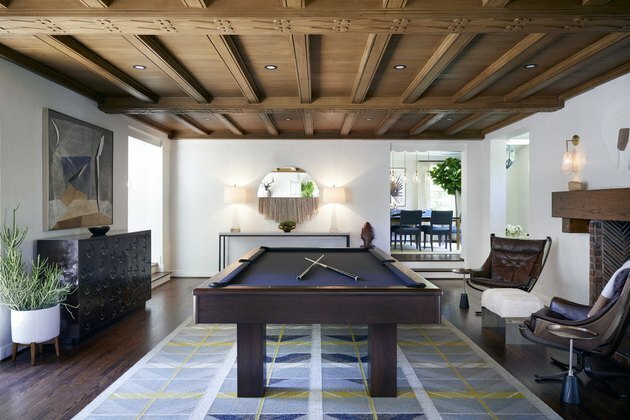 The stunning wood paneled ceiling with ceiling beams, dark leather lounge chairs, and navy felt-covered pool table evokes a masculine country club charm that we adore. 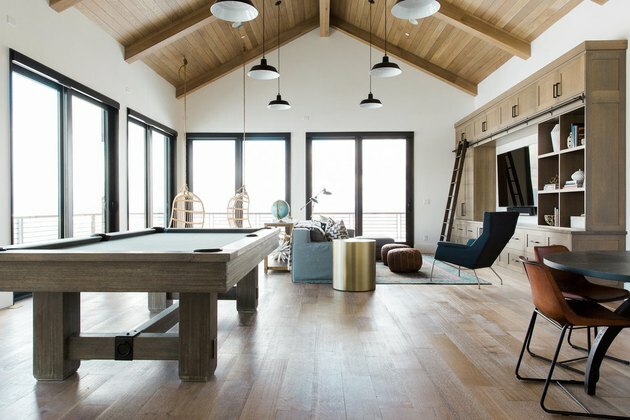 When you get tired of playing pool in this modern Utah retreat, take a break and enjoy the spectacular mountain views while sitting in one of the two woven rattan chairs hanging from the rustic wood beam ceiling. And if that doesn't tickle your fancy, you can always climb up the rolling library ladder and select an entertaining movie to watch while curled up on the cozy sofa. Wood ceiling beams, rustic half-timbering, and iron chandeliers give this Mountain Brook, Alabama home a medieval vibe. 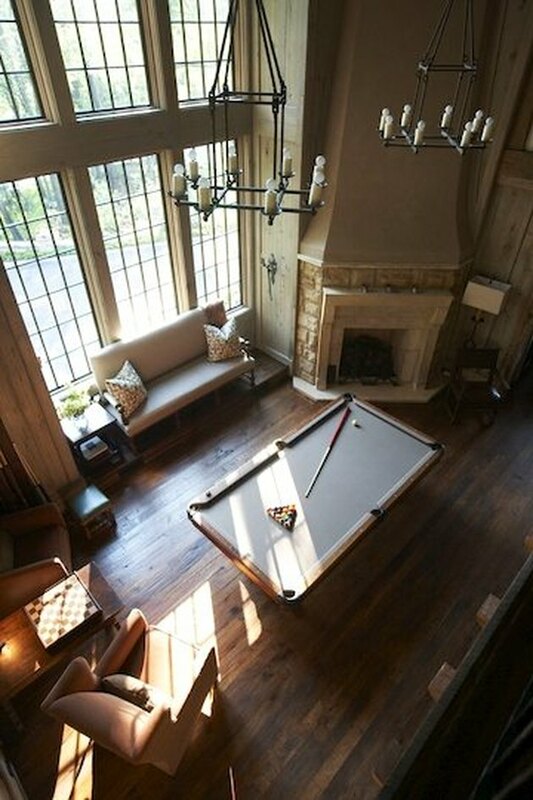 The oversize windows, a stone fireplace surround, and traditional seating such as wing back chairs evoke images of on Old English great hall, complemented by a pool table and game table for entertaining. A sleek, minimal backdrop and adult bean bag chairs create an inviting environment that brings together kids, adults, and dogs alike. 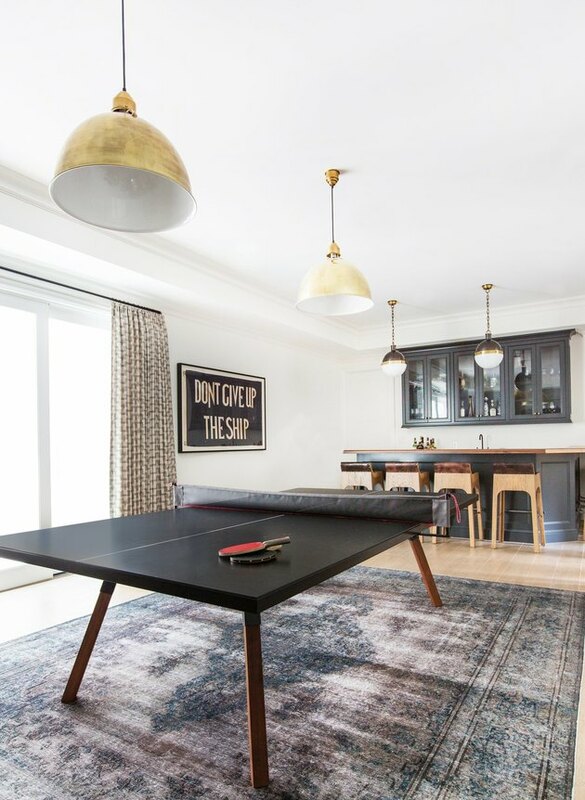 Whether to watch a great flick or challenge one another to a riveting game of air hockey or darts, it's no surprise that this multipurpose media room scores major points. The only thing missing? A popcorn machine. credit: Jamie Bush + Co. Feeling like a set from a James Bond movie, the mix of rich dramatic hues, eye-catching light fixtures, and modern finishes make this vacation home particularly impressive. 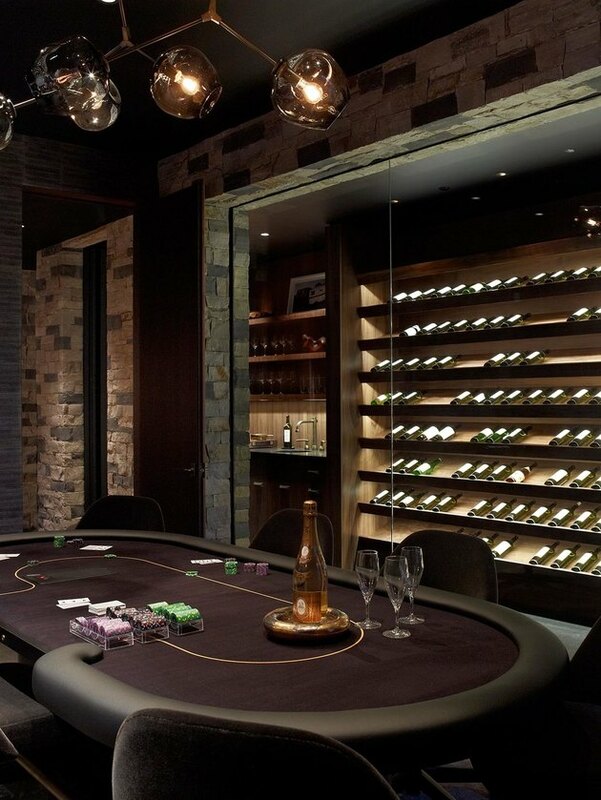 Located in the mountains of California's Martis Camp, this fun-filled game room boasts a gorgeous poker table, which is directly adjacent to a stocked bar and wine cellar. We can't get enough of the moody vibes perfect for a high stakes game. 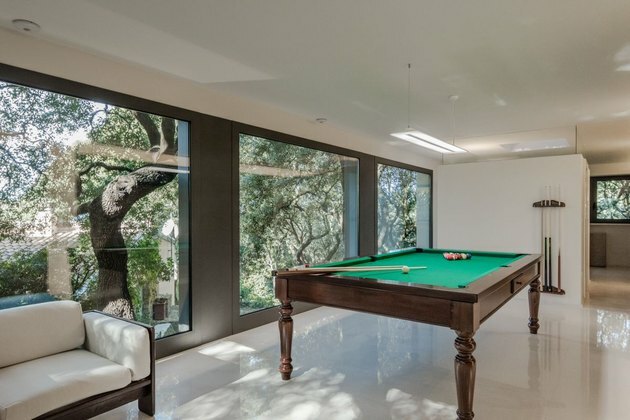 We could see ourselves getting into some serious billiards action in this man cave (or lady lair) immersed in the middle of the woods. The minimalist indoor-outdoor design allows you to focus all of your attention solely on the game, or the striking floor to ceiling views of the lush greenery. The green felt and dark wood frame of the pool table mimic the surrounding wilderness. Art appreciation is key in this fashion designer's London penthouse. 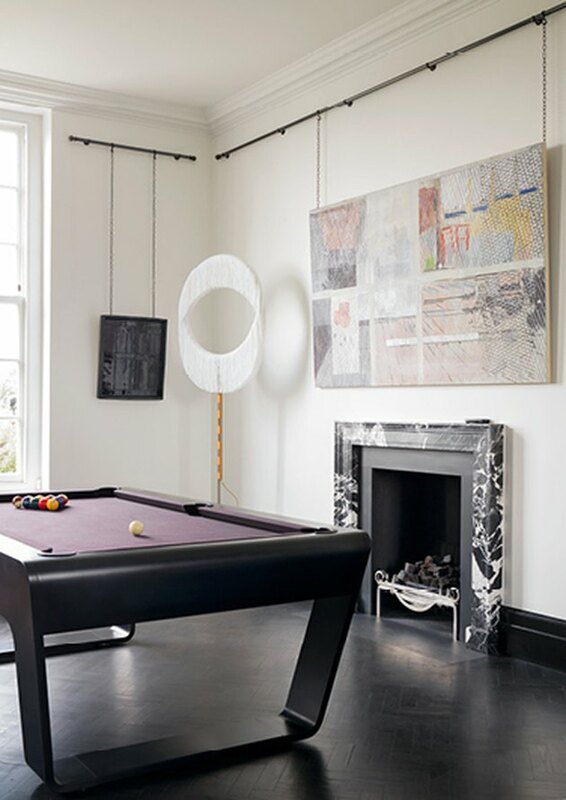 Surrounded by museum-grade artwork, one could easily mistake this game room for a swanky modern art gallery. The violet-hued felt pool table blends in beautifully with the soft artistic color palette, while the striking black and white veining of the marble fireplace surround makes a bold statement. 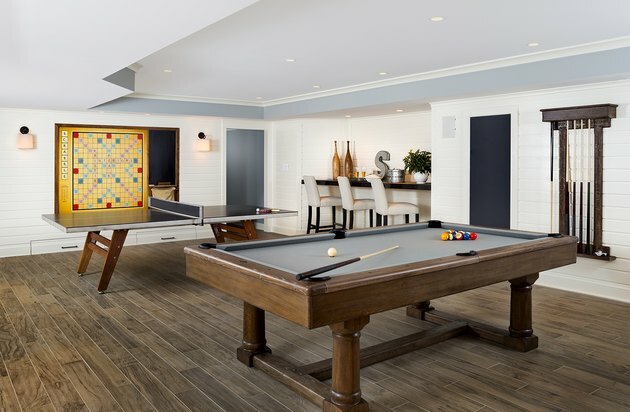 This Santa Monica game room by Amber Interiors surprises and delights guests with its effortlessly cool Cali vibes. After a few rousing rounds of table tennis, a cold beer is just steps away at the fully-stocked bar — a gamer's dream.